cheering its union with blue. This is no watercolour plant. a life born from Winter’s death. a choir of yellow lungs, inflated. But then again, I’m not allergic. I will avoid any puns using the word spring in this post, however hard that is for me. 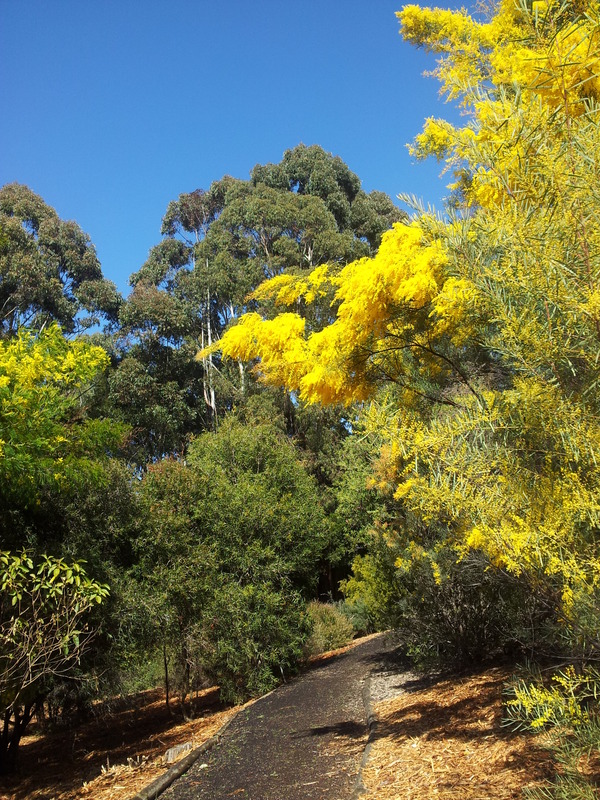 Tonight (Tuesday) I’m reading at The Gods on the ANU campus (a short distance form the Australian National Botanic Gardens, where I photographed the wattle), with Melinda Smith and Owen Bullock. I am reading mostly new material. I am finding it easy to write at the moment, which has to be a Good Thing. I just hope that it’s not a sudden blaze, fading as quickly as a wattle. Good to see that I am keeping my glorious pessimism well watered! It’s like a wattle, but beige, and it smells a bit like very well used socks.